Each day Diamond Manufacturing strives to deliver excellence in product quality and customer service. We are the first perforator in North America to be certified to ISO-9002, and our quality management system is designed to ensure that you get the quality products and services you need, when you need them. We honor your timelines. From providing the shortest lead times, to producing the materials you need in a timely manner, our entire production process is committed to delivering your products on time and on budget. Diamond Manufacturing has a proven record of supplying product that is accepted 99.3% of the time. Adhering to strict internal audits, we offer tolerances that surpass industry standards and we continue to improve our processes each day to meet the highest quality standards. With 50 perforating presses, 9 turret presses, 5 stamping presses and 4 brake presses, Diamond perforates 100 million lbs. per year, quickly and accurately. We can output around 300,000 perforations per minute with extreme accuracy, and can perforate almost any metal and a variety of plastic materials. We also provide more than 2000 different perforation patterns to choose from, and have the skills and tools to create custom perforation shapes or patterns, when you need them. Our process doesn’t stop at perforations. Diamond is your one-stop-shop for fabrication and finishing services, including roller-leveling, welding, laser cutting, anodizing, degreasing, powder coating, and more. In addition, our Enhanced Service Packages – including blanket contracts, just-in-time deliveries, ship-to-stock programs, and guaranteed pricing – help you meet the challenges of getting your product to market as quickly and cost-effectively as possible. Diamond Manufacturing is dedicated to helping you meet your most exacting requirements. Our staff of industry experts will collaborate with you to design the most effective solution for your particular application and help you transform your vision into reality. When your project requires a custom solution, Diamond has the expertise and capabilities to meet your specific requirements. Whether it is a custom perforated sheet or a custom perforated coil, we will work with you to deliver a product manufactured to your specifications. If you require custom assembly and customized finishing, we will be happy to provide that was well. Since 1915, Diamond Manufacturing has been providing original equipment manufacturers (OEM’s), job shops, and architectural firms with quality perforated materials. With a century of experience to draw from, our staff offers the deep industry knowledge required to expertly address customers’ needs. You can rely on Diamond’s team to provide the assistance you need, when you need it. Whether it is collaborating on a design, providing you with value added services that save you time and money, or assisting you with online verification and tracking of orders, we will assist you each step of the way, making sure that your project goes as smoothly as possible. On-time delivery is essential. That is why Diamond offers six convenient manufacturing facilities located within a short distance of major markets. 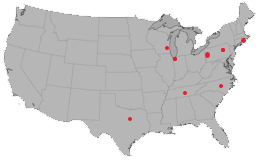 These include manufacturing and fabrication facilities located in Wyoming, PA; Michigan City, IN; Cedar Hill, TX; Manchester, TN: and New Berlin, WI; and stocking locations located in Charlotte, NC and in the Chicago area (Michigan City, IN). Our proximity to key markets helps contain shipping costs and makes it possible for us to rush deliveries when you need material fast. These are just some of the many reasons why Diamond Manufacturing is America’s leading perforator. To find out more about how Diamond can assist you with high quality perforated materials and products, delivered on time and on budget, please call us today to discuss your needs.